Customize these lovely keychains, order it and we will materialize it with 3D printers. Personalise with lovely texts, your love name, nicknames or any other fun messages, quote to smarten the keychains. Do it Yourself (DIY) because custom keychains make a charming and creative 3D printed gift anytime against mass products. What kind of "LOVE" keychain do you want? Write us and will 3D print it to you! Order one of our 3D printed gifts below! Heart Shaped Keychain with custom text option. Custom 3D printed gift. The text can be anything and depends only on your creativity. Eg. : your love name, nickname, company name, quote, etc. 5.) Fill out your data then write us what text you would like on the keychain in the "Comment" box at the "Confirmation" page in case of Custom Text option max. 20 characters. Cutted Heart Shaped Keychain with custom text for lovers. Custom 3D printed gift. The text can be anything and depends only on your creativity. Eg. : your names, nicknames, quotes, etc. 5.) Fill out your data then write us what texts you would like on the two keychains in the "Comment" box at the "Confirmation" page - max. 2x14 characters. 4.) Fill out your data then write us what texts you would like on the two keychains in the "Comment" box at the "Confirmation" page - max. 2x14 characters. Hearts Shaped Keychain with initials. Awesome custom 3D printed gift for Valentine's Day. It can be add two monograms to the keychain. Eg. : initials of your names. 4.) Fill out your data then write us what letters you would like on the keychain in the "Comment" box at the "Confirmation" page. Only two separated characters. Name Keychain with Hearts. Awesome custom 3D printed gift for Valentine's Day. The text can be anything and depends only on your creativity. Eg. : your love name, nickname, company name, quote, etc. 4.) Fill out your data then write us what name you would like on the keychain in the "Comment" box at the "Confirmation" page. Maximum 12 characters. Hand Heart Keychain for Couples. Custom 3D printed gift. It can be add 1-1 letter to the keychains. Eg. : initials of your names. 4.) Fill out your data then write us what texts you would like on the two keychains in the "Comment" box at the "Confirmation" page - max. 2 letters. Heart Shaped Dog Keychain with Name. Awesome custom 3D printed gift for the dog lovers. The text can be anything and depends only on your creativity. Eg. : your dog's name, nickname, etc. 4.) Fill out your data then write us what name you would like on the keychain in the "Comment" box at the "Confirmation" page. Maximum 8 characters. "Love Hearts" - For Valentine's Day, what could be a more beautiful, more personal gift than a keychain decorated with the name of your Dear? But as a companion gift for weddings a kind little thoughtfulness. You can write your personal message, which will make the gift even more touching. Or even a double gift - your Dear’s and your keyring exactly matched! Did you come up with ideas and want another model? We have implemented many requests with 3D printing. We have already made Honda Civic Shaped Keychain, Fitness Step Pad Keychain, Owl Bookend or HIP-HOP Penholder as well. You can order us from 1 piece (no minimum order quantity of hundreds of pieces) but we also make souvenirs for friends, school classes and smaller companies according to individual needs. Write us what 3D print is your demand! Nowdays a modern keychains is not only a practical way to keep keys together but a trendy and fashion accessory. 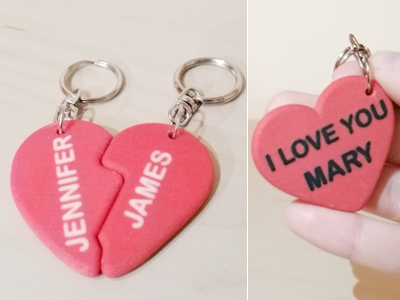 These style of key rings can show your love to your girlfriend or friend. It could be a charming gift for weddings or to celebrate of your love anniversary. "Love Hearts" - For Valentine's Day, what could be a more beautiful, more personal gift than a keychain decorated with the name of your Dear?